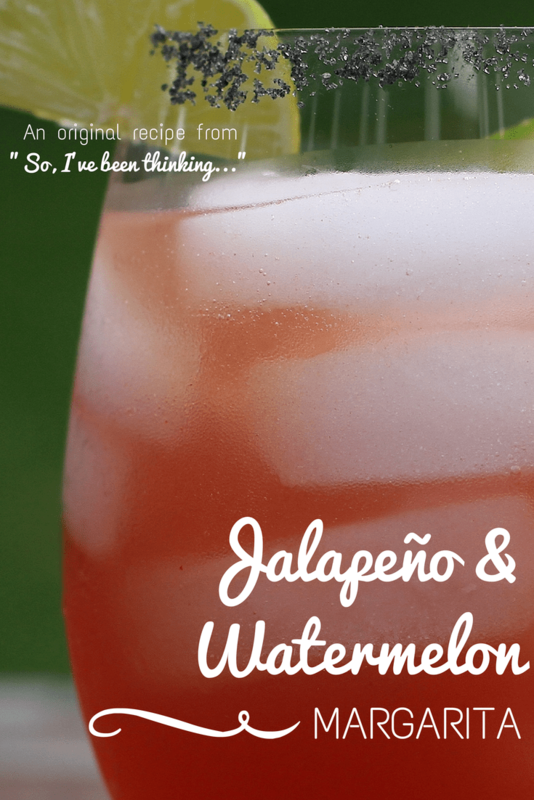 Jalapeño Watermelon Margarita - "So, I've been thinking..."
Last week I was asked to describe my perfect summer meal. Of course I had to include a cocktail. It’s natural for us to make margaritas in the summer, so when Greg and I started putting dinner together (which was pretty much the same menu I listed on Friday: fish tacos, pineapple salsa and tortillas with roasted corn & jalapeño salsa) I kept thinking I wanted to try something a little different from the standard margarita. Using a little creativity and ingredients on hand…the Jalapeño Watermelon Margarita was born. This drink is light, fresh and fairly spicy. The watermelon and the lemonade are the only sweeteners and can both be adjusted to taste. If you are thinking, “that’s a lot of work,” take heart – you are just making the watermelon small enough to fit the processor and it filters through the sieve quickly, it took me about 10 minutes or less to make the juice. Do you think you’ll try it? Let me know if you do. With the holiday weekend coming up you might want to serve at your next get-together. That sounds A-MAZING. I’ll be giving it a go. I’ll report back with results. Let me know how it turns out Allie! This is perfect for your Mexican dinner nights, and the non-alcohol watermelon lemonade is great for the kids. I think I would definitely add the triple sec to it!! I’m a sweet girl! BUT- if I just use a less spicy tequila, that may be better. YUM! Definitely add the triple sec and you don’t have to have any spice – it’s very adaptable. I love a spicy kick, so I imagine I’d enjoy this. Yum – I’m so happy you shared the recipe – can’t wait to try it!!! Can’t wait to try this! I wish I’d seen this before I created my drink collection for the other day, but rest assured it is being pinned right now! When did you say you were coming over?! So so so yummy! Pinned to my food board. I want one. I wish I could have one with you!